Interior designer Eric Egan hosts the inaugural opening of L’Artigianato design studio with the debut showing of RAINERI, the chinoiserie created in partnership with Fromental, award-winning wallcoverings atelier. Milan Salone del Mobile 2019, Fromental collaborates with renowned interior designer, Eric Egan to develop a custom chinoiserie for his Milan studio. Milan Salone del Mobile 2019, Fromental collaborates with renowned interior designer, Eric Egan to develop a custom chinoiserie for his Milan studio.Interior designer Eric Egan hosts the inaugural opening of L’Artigianato design studio with the debut showing of RAINERI, the chinoiserie created in partnership with Fromental, award-winning wallcoverings atelier. After three years of renovation in a in a wonderful late 19th century building in the Brera district of Milan, the space was restored ensuring they preserve the original charm and character. The result is an artistic, creative space which reads more like a quirky, personal residence than a traditional office. Fromental and Eric Egan worked for over a year designing and creating the RAINERI wallcovering which has been installed in the new Mandarin Oriental Lake Como, designed by Eric Egan which opens in the weeks following the Furniture Fair. The chinoiserie draws inspiration from the designs of Carlo Antonio and Vittorio Raineri, Milan-based artists from the turn of the 18th century. The design perfectly reflects the Lombardy compositional style and draws on exotic Neoclassicism. 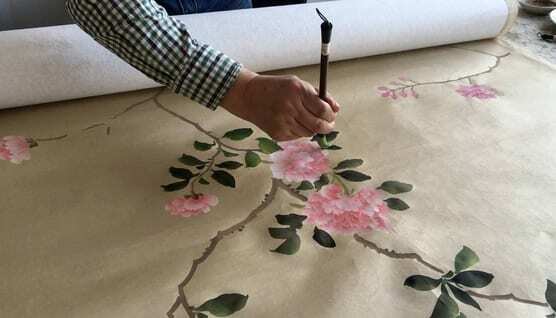 The panels have been painstakingly hand painted taking over 1,700 hours to complete, showcasing the expertise and vision of Fromental’s talented artisans. The event will take place at L’Artigianato design studio Piazza Castello 11, Milan. The wallcovering has a playful sense of spatial depth by color shifts within a hand drawn line, and to further showcase Fromental’s creativity, Design Director Lizzie Deshayes and Production Designer Emma Ford will be painting on site during the design week. Fromental will also preview their new design BARGELLO a painterly needlepoint flame stitch design with architectural banding cleverly running through the paper drawing the viewer’s eye along the entire wall. The preview of RAINERI and BARGELLO will be supported by GARDEN OF HOURS in the bathroom and two further designs featured on a custom-made screen: KIKU, a wall covering featuring Japanese Chrysanthemums, and RAW Fromental by Maresca Interiors, a bold geometric design inspired by Brazilian Tapestries.